The only way to to graph Trump’s foreign policy performance is as an asymptotic equation approaching infinitely bad. His horrid example at NATO fits that pattern. He is doing everything inhumanly possible to alienate every friend we have. And he claims victories to describe his failures. I really don't know what anyone can say about him, and particularly about this display of - surrealism. I also have no words to apologize adequately to the rest of the world. Tell you what, though - Orange Judas is living proof that liberals are not violent! When I initially saw this on tv, yesterday in the a.m., my head exploded. I've since recovered, but just barely. A child in kinder would have behaved and spoke better than this clown. This excuse for a president is showing just how totally crazy he is, on an international stage. I never thought SOOOOO many Americans, his supporters, could be so intensely, so stubbornly stupid, as to continue the support. That picture is utterly spot-on! The only time tRump is not a national disgrace is when he's asleep. Trump lives in his own delusional world. I wish he could live there without destroying our country. After a few days of embarrassment on the continent, Drumpf went over to the UK, but not before telling journalists in Brussels that PM May did a bad job on Brexit, and he would have done it much better. He had told her how to do it, but she just wouldn’t listen. All the while May was doing her best preparing a grand tour for him with lots of military parades. All the photos we get to see of Drumpf these days in Brussels are people around him looking the other way, not meeting his eye because they are so embarrassed by his presence, his big mouth and his failure to listen to anyone. I don’t think anyone but Putin will be asking Drumpf for tea any time soon. Ughhhh it was all on our local news… CRINGE!!!! Award-Winning Music Composer. Specialises in Film Music & Choral Music. Organist with @magschoir. Hundreds & hundreds of protestors outside #BlenheimPalace making an amazing noise! Incredible atmosphere! So proud to be here! No, @realDonaldTrump, Britons do NOT like you or your racist immigration policies. #HeyHoRacistTrumpHasGotToGo #TrumpUKVisit"
There are times when I just have to go on hiatus when it comes to watching or reading the news. The reason? I just can't stomach looking at Trump's smug face, or listening to the ignorance, lies, and vitriol that he spews every time he opens his mouth, I can't believe there are so many people who are stupid enough to keep supporting him as his indifference or even contempt for the common people becomes more and more apparent. I have watched some of the footage of Trump in Europe so far, and when you compare him to the other world leaders, he is like a bumbling child with no sense of dignity, lacking in social skills. If he had any insight at all he would take a look at footage like this of himself, and at the very least, he would get a tiny clue that his behavior does not match that of those around him. If he was a more typical phony, and not such a narcissist, he would be able to read the faces and body language of the people around him and come to some realization that he is not eliciting positive reactions from people. He probably looks at himself and thinks he's the greatest world leader in all of history.I keep hoping that people of other countries know and remember that Trump does not represent most of the people of the United States. He has to go away eventually, unless he declares himself Emperor for life. Totally disgraceful actions on his behalf. He speaks and treats these leaders like crap. Shows no respect to them what so ever. He shall pay for his sins. Hopefully soon. I just watched the protesters in England against tRUMP on CNN & MSNBC. Thousands are taking to the streets and time away from work to protest and I'm glad for it. 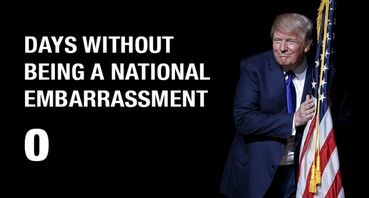 tRUMP is an embarrassment to America and the World. He is a cancer on America and the World. When will this nightmare end? Vote BLUE in all elections and RESIST. I am not an American but I feel offended for truly patriotic Americans seeing Drumpf clutching the US flag. It just makes me want to barf all over him! It is nothing more than a prop for him, helping him to prey on real Americans. That is all optics, playing to his rabid base of deplorables, not love of country. If I ever met him, I would want to rip that US flag pin from his lapel. He does not deserve to have it let alone wear it. The cuts are from one off items that are not expected to re-occur, but that will be lost on the Orange Ogre! I can have patience with the people, even the Drumpf base who have been lied to and manipulated, but not with the Orange Ogre or congressional Republicans. Aw, come on. He said his comment on May’s Brexit failure was fake news. So, who ya gonna believe? The audio tapes and witnesses, or our stable genius? I’m worried for journalists, though. The POTUS calling legitimate agencies “fake news” gives the other authoritarian dicta- uh - leaders permission to ignore, jail, and murder members of the press with impunity. Stupid, vomitous, dangerous lout. Every day, some new stupidity or embarrassment. Vote in NOV. This pretender to the Oval Office is a true abomination. I cringe every time I watch the news because it never ends and he never stops and his visit with the Queen brought no new surprises.. But at least the protesters in England and Scotland target him instead of us. I love your last line: "Whatever boycotts or sanctions you deem necessary, I ask for mercy to the people by targeting Trump’s assets." That should be the target. He's making millions off we the taxpayers. He's the crook too many of us knew he was.